These "muffins" are yummy fresh out of the oven or leftover! We like them for dinner with pancakes when we are craving breakfast for dinner. They are pretty easy to make. From start to finish, you are looking at about an hour. I hope you enjoy! 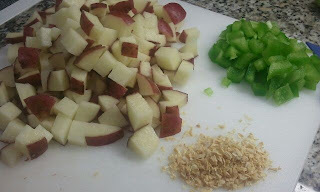 First, chop your bell pepper and onion and cut your potatoes into small cubes as seen below. In a large non stick skillet place your 2T of butter. 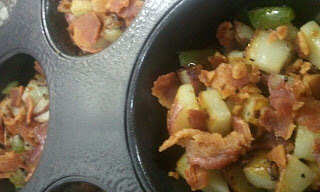 When the butter is melted, put the potatoes in with the heat on medium-medium/high. Let them cook for 5-10 minutes before you add in the bell pepper and onion. 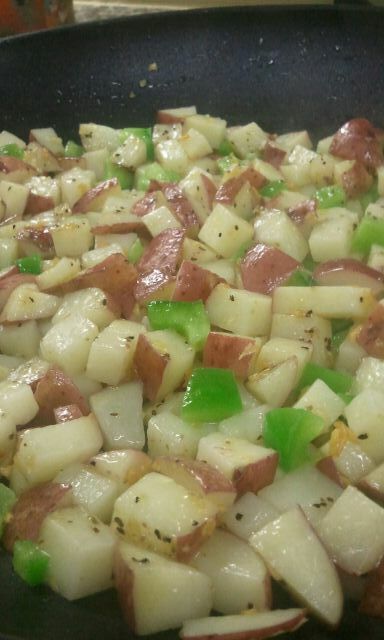 Once you add in the peppers and onions, season it all with salt and pepper to your liking. I normally give the pan a good twice over with each. Let these things cook until they are done. Once the potatoes, peppers and onions are done, liberally spray 6 muffin tins with non stick spray. Fill each cup about half full, definitely no more than that. 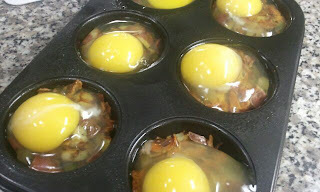 Sprinkle a little bit of cooked bacon in each cup and then top with a raw egg. 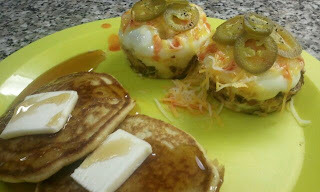 Place muffin tin in a pre-heated 350 degree oven and let bake for 30-35 minutes. 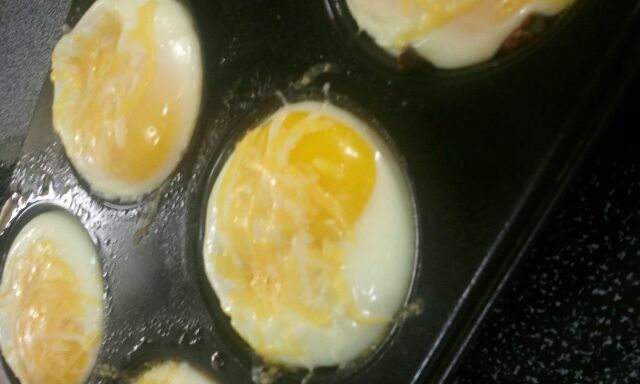 Remove from the oven and sprinkle with shredded cheese. Place back in the oven until cheese is melted. Please note: Jalapenos and Hot Sauce are optional... This is how my hubby likes them! !